Following a four-month shoot, production wrapped earlier this month on incoming period thriller The Tooth and the Nail. 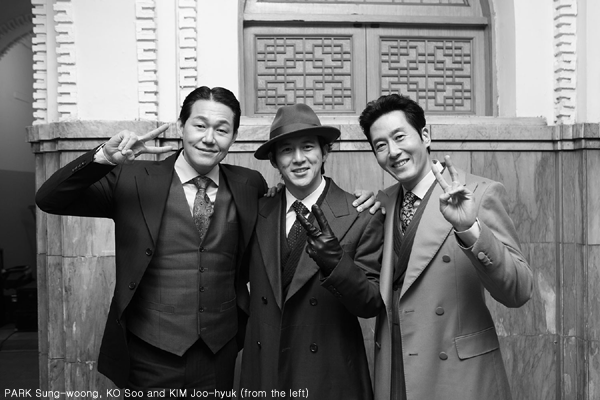 Directed by JUNG Sik, the Japanese Colonial Era mystery film stars KO Soo, KIM Joo-hyuk and PARK Sung-woong. Based on a 1955 pulp fiction thriller of the same name by Bill Ballinger, the story features a man throwing himself into the mystery behind his fiancee’s death. The Korean version is set in the 1940s. The Front Line (2011) star KO Soo takes the lead in his first film role since 2014’s The Royal Tailor, in which he starred alongside HAN Suk-kyu. Co-starring is KIM Joo-hyuk who has a big year ahead of him, having already featured in the romcom Like for Likes and soon to be seen in HONG Sang-soo's next and as yet untitled film, and the North Korea-themed blockbuster Cooperation, which began shooting on March 10th. Alongside the leads is in demand performer PARK Sung-woong, whose recent credits include Office and The Shameless, both of which premiered at the Cannes Film Festival last year, and last month’s smash hit thriller A Violent Prosecutor. JUNG returns to the director’s chair nine years after he co-directed the acclaimed Colonial Era horror film Epitaph (2007) with JUNG Bum-shik. Following post-production, The Tooth and the Nail is expected to be released in the second half of 2016.